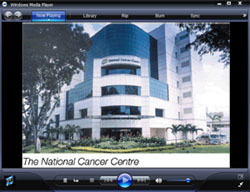 CNETS organised a free seminar, its very first public event, which was held in Singapore at the National Cancer Centre Theatre on 5 March 2009. "Targeted Radiotherapy for Neuroendocrine Tumors"
One of the first successful applications of radiopharmaceuticals for treatment of solid tumors is the use of radiolabeled somatostatin analogs to target metastatic neuroendocrine cancers. The majority of these tumors possess somatostatin receptors and therefore they can be visualised and targeted with the radiolabeled peptide. This peptide receptor radiotherapy (PRRT) usually provides excellent clinical benefits with minimal side effects. Dr. Baum is among the world's experts in targeted radiotherapy for neuroendocrine tumors, and his clinic treats over 1,000 patients per year using this new approach. His talk covers the needs of neuroendocrine patients, interdisciplinary collaboration, targeted radiotherapy, how therapy is personalised, and how the molecular response to treatment is measured. The talk was introduced by Dr. Joseph Wee, Senior Consultant, Department of Radiation Oncology and Head of Clinical Trials & Epidemiological Studies at the National Cancer Centre of Singapore. Registration is now closed. If you missed the event, please review the recording (refer to column at right). 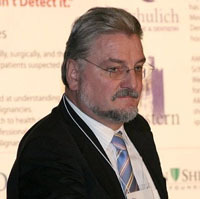 As part of our outreach to patients, caregivers and physicians throughout the region, we are pleased to share a recording of the presentation by Dr. Baum. This event was supported by National Cancer Center of Singapore and the Chapter of Gastroenterologists College of Physicians, Singapore.